Beth Kirby of Local Milk carries her Southern heritage -- and the ingredients, dishes, and recipes that come with it -- with her wherever she goes. Every other Monday, that place is here. Today: Gussied up Southern diner food you'll want to make -- and eat -- right now. I, like a lot of kids from the South, spent my fair share of late high school nights drinking black coffee and eating plates of hashbrowns, buttery grits, and sunny side up eggs at the Waffle House. The Waffle House was good for that; that, and blaming the truckers for the smell of cigarette smoke in my hair if my mother happened to notice. I’m not one to turn my nose up at those grits -- their buttery simplicity is fine by me. But I’m also not one to leave well enough alone, and in the case of these honey goat’s milk grits, I think I can safely say that I’m glad I didn’t. Made with goat’s milk, chèvre, and raw honey, you might not find these grits in any diner, but they do the fine tradition of Southern diner food justice. 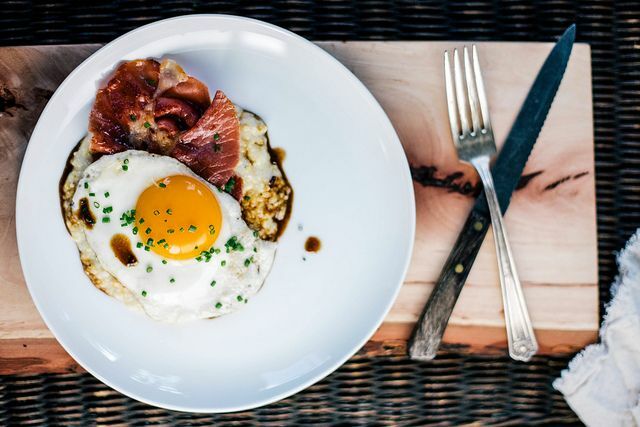 Paired with crispy cast iron-fried country ham, red eye gravy, and a sunny side up egg, you have an updated version of an enduring classic. The slight sweetness of honey in the grits plays perfectly with the saltiness of the ham and the nutty coffee in the red eye gravy, and the tang of goat cheese brightens the whole thing up. I really can’t think of a plate that looks, smells, or tastes more like breakfast. 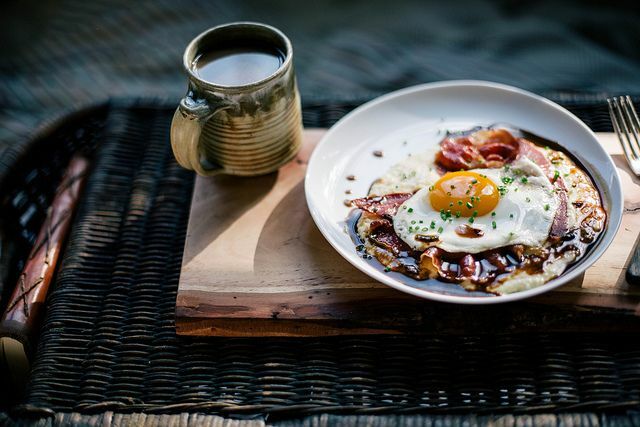 The red eye gravy is a wonder in itself: whoever thought to deglaze a skillet used to cook salty ham with some coffee is a personal hero of mine. We have that moment to thank for this salty, smoky, buttery gravy. I make mine simply by deglazing the pan I fried the ham in with a bit of coffee. No water. If there wasn’t much fat in the pan, I throw in a pat of butter. Swirl, thicken. Done. It’s strong, and a little goes a long way. It’s the stuff of cravings. Serve this for brunch, or for breakfast in bed. 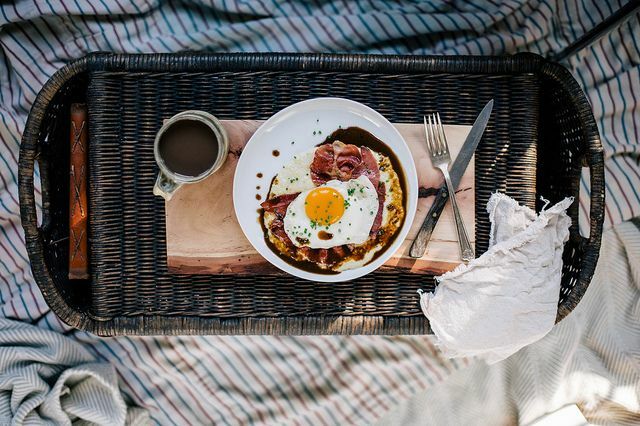 Or even better, serve it for my favorite weekend tradition: breakfast in bed for dinner. There are few comforts that can touch a gussied up plate of diner food. In bed. For dinner. I speak from experience. ONLY thing it's missing? Baking soda biscuit to mop up the red-eye gravy!! My ex-mother-in-law, an absolute SAINT of a woman, born & raised in a very small town on the Florida/Georgia line, taught me the finer points of Southern Cooking-and I'll NEVER forget the smell of their large Southern Home, always filled with a combination of her unbelievable cooking...and Wisteria, (which grew over and around their wrap-around porch). Even when the wisteria wasn't blooming, you could smell it and to this day, many, many years later; country ham, red-eye gravy and Wisteria = home, LOVE, Family. I miss that beautiful lady, now an angel, I'm sure! Thank you from the bottom of my cow's milk allergic heart! This is everything my lame breakfasts wishes they were. It's soo easy. Especially on the weekend. Or like a Tuesday evening. It's basically a cure all for a bad day...try it! I love this so much, can't wait to make! do eet! red eye gravy & grits are a lifelong love of mine. i want to convert all the peoples.